Three nine pound watermelon were processed into seven liters of juice. The complete watermelon was utilized rind and all. I cooked some rind alone and made a slurry as a test. It was found to be as sweet as the red part.The rind is touted to be very nutritious.Procedure was cut into pieces,place in cooking pot with three liters of water, cook until soft, blend into a slurry, strain through a food mill 2 mm mesh.Put food mill residue through Champion Juicer to extract all nutrients.Place in liter jars and Pressure Can at 15 PSI for 15 minutes. The juice is sweet and pleasant tasting. 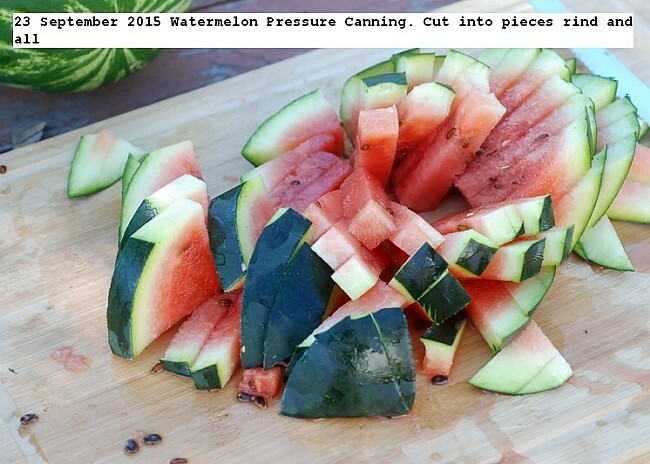 This entry was posted in Uncategorized and tagged 23 September 2015 Watermelon Pressure Canning, Preserving Watermelon, Watermelon. Bookmark the permalink.